How could I have a blog entitled “Chubby Soul” and not have a chocolate chip cookie recipe? I couldn’t, obviously. Trouble is, a quick Google search for “chocolate chip cookie recipe” comes back with eight and a half MILLION results. What’s a girl to do? In cases like these, involving tasty baked goods, I always recommend the same method: Try them all. I haven’t tried all eight and a half million cookie recipes (who’s got the time?) but I have tried a lot of them. The vast majority were way too sweet for my taste. Lots were too greasy, some were too flat, a few were too thick and plenty of others were too bready or crumbly or crispy or cakey. Almost all of them were delicious when fresh out of the oven, but hours later faded to “meh”. None of the recipes, however, were perfect… until now. 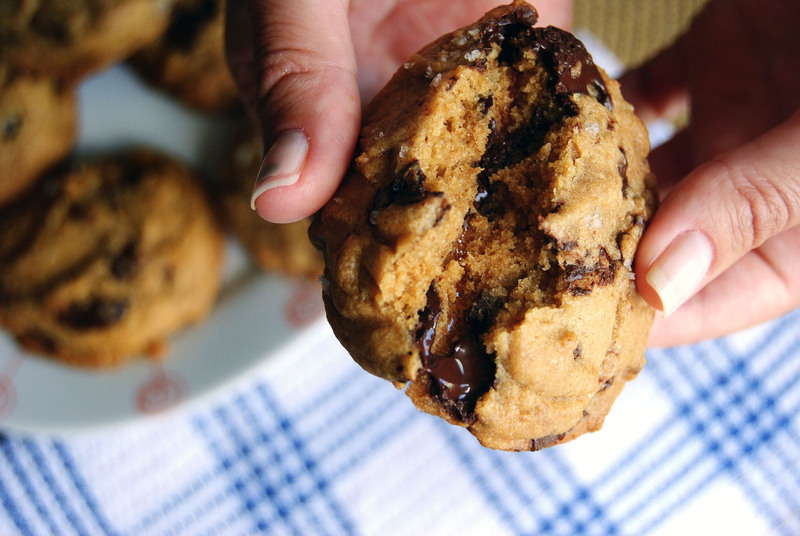 Without further ado, allow me to introduce you to the perfect chocolate chip cookie. Perfectly sweet, perfectly chewy, perfectly thick, with a rich brown butter flavor and dark, dark, daaaaark chocolate. If that weren’t enough, a sprinkling of sea salt adds an element of surprise and makes this cookie stand out from every other chocolate chip cookie you’ve ever eaten – I promise. Fresh out of the oven, these cookies are divine. Hours or even days later, they are still just as divine. I don’t know how… it must be magic. These are perfect. No, really. Don’t change a thing. They are chewy without being too dense, and the edges have just the right amount of crispiness. 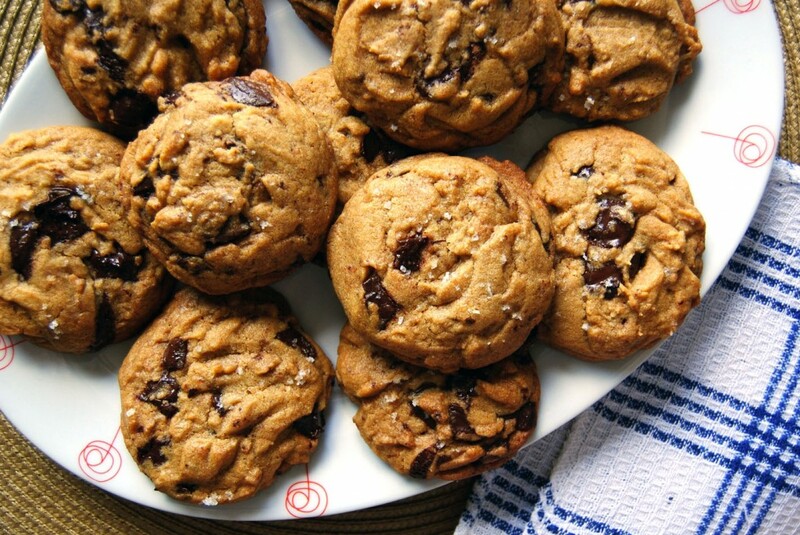 Brown butter and molasses gives the cookie a rich and nutty flavor, while dark chocolate gives… well, you know! Then there’s the salt. I admit, I was so skeptical about the salt that when I made the first batch of these cookies I only salted half of them, but then the unsalted ones sat there lonely on the plate while we gobbled up the others first. Poor little unsalted cookies just couldn’t compete. Try it – you won’t be disappointed. In a medium bowl, mix together flour, salt and baking soda. Set aside. In a medium skillet, brown half of the butter (1/2 cup). Start by melting the butter – it’s a good idea to cut it into pieces so that it melts evenly. Once melted, the butter will foam up a bit and make lovely popping noises like a bowl of Rice Krispies. Stir frequently with a whisk as the butter begins to brown. You’ll see little brown bits start to form at the bottom of the pan; when those bits are a nice, dark brown (but not black!) remove the butter from the pan and pour it into a small bowl. Don’t forget all those tasty brown butter pieces. Let the butter cool for around 20 minutes. In a large mixing bowl, use an electric mixer to cream together the remaining butter and brown sugar until light and fluffy – about 5 minutes. Add vanilla and molasses and mix to incorporate. Add the cooled brown butter and the sugar, and mix for another two minutes. Add the egg and egg yolk and mix for one more minute. Add the dry ingredients and mix by hand, using a wooden spoon or rubber spatula, until just incorporated. Careful not to overmix! Gently fold in the chocolate chunks. Wrap dough in plastic wrap or parchment paper and press into a disk. Refrigerate for at least 30 minutes (though longer is better). About 15 minutes before cookie time, preheat the oven to 350ºF. Line a baking sheet with parchment paper and scoop dough into small balls (about 2 tablespoons or the size of a large walnut). Place dough on the prepared cookie sheet, leaving about two inches between each cookie. Sprinkle each cookie with just a teeny bit of sea salt. I love everything chocolate and these cookies look delicious. Just be careful because they are addicting! I made these cookies for a Halloween party and they were a hit! Thanks, Kalen!